When you build any Minecraft game, the first thing you need is a basic scene for the game. For Monster Arena, you need a large, enclosed area. 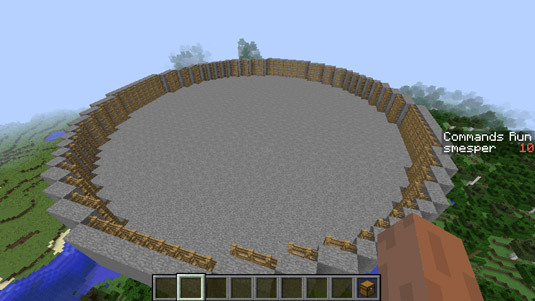 This shows the kind of arena you build — a large, circular platform that has a radius of 20 blocks. Surrounding the arena is a fence, reinforced with stone. The fence is required so that neither the monsters nor the player can leave the arena throughout the game. As you may have already learned in geometry class, the radius is the line from the circle’s center point to any point on the circle’s edge. Because everything in Minecraft is made with blocks, you count the blocks between the center and the edge of the circle, and that is the radius. Here, you can use WorldEdit commands to make the arena in LearnToMod. 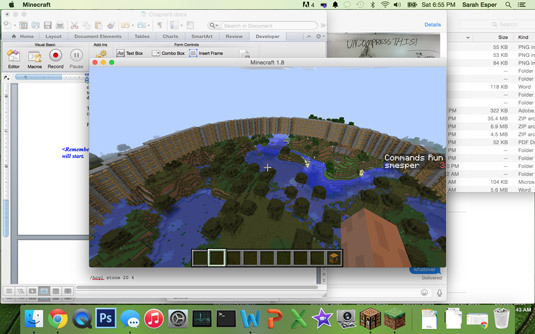 A WorldEdit command is one that you can run in Minecraft to edit the world, such as making thousands of blocks appear at once. You can explore lots of WorldEdit commands online — search for the term minecraft worldedit commands using your favorite search engine. Visit the official WorldEdit wiki to see a list of all WorldEdit commands for Minecraft. Just click on one of the links to a category, like Filling Pits under Utilities to find the WorldEdit commands associated with filling pits. To make the circular arena, you need to make a cylinder and a circle, which you can find under the Generation category on the wiki (it’s toward the bottom). This image shows how to use the WorldEdit commands in Minecraft. 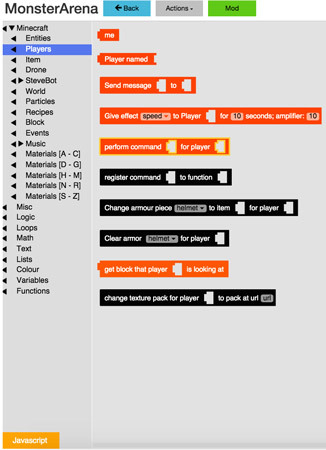 The WorldEdit commands use algorithms (another way of saying list of steps) to create the effect in the Minecraft world. The is from the wiki page about WorldEdit commands. 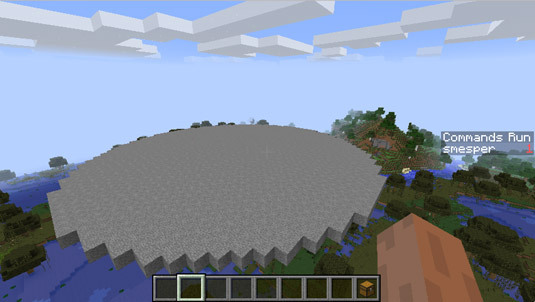 Before writing the code to make the arena, test out the WorldEdit commands in Minecraft. This is how to make a platform made of stone and with a radius of 20. This is the platform that gets created. When you’re trying to build a large structure, double-click on the spacebar to hover, and then click and hold the spacebar to move up into the sky before running your mod. This action creates the large platform in the sky and makes it easier to see. You can also test making the fence. This is how to make a stone fence. If you don’t move, you can then give this command to make a wooden fence inside the stone fence. This is what the fence looks like. If you move after you have created the platform and before you create the fence, your fence won’t fit perfectly around the platform. You can try it to see what happens: Run the platform command from above and then move forward until you’re near the center of the platform. Then run the command to create the fence. If you call all three of these WorldEdit commands without moving, you create an arena with a fence around it. Calling code means that Minecraft can handle that task. After you have tested the WorldEdit commands, you can actually call them from the LearnToMod mod! To call WorldEdit Commands from LearnToMod, you have to use a PerformCommand block, which can be found under the Players category. When you use a PerformCommand block, the first slash mark (/) is already included, so you need to have only one slash mark to make the platform and fences. This image shows you what the main function looks like for the initial scene. 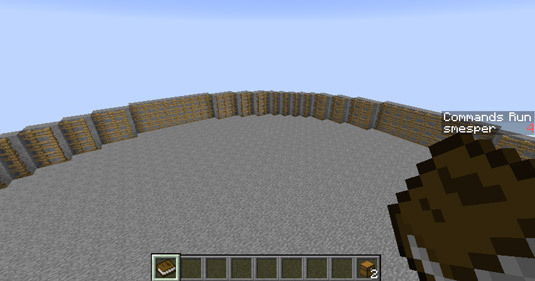 Test your mod to make sure that the result is the same kind of arena shown above.